A troubled young man, drowned in his thoughts, receives a letter from a mysterious stranger in a café. The letter reads “Who am i?” Seconds after that, a body drops from the sky on a car parked beside the café. Chaos rises within people. The man, scared and confused, walks away from the café immediately. He suddenly finds himself in an empty city with the mysterious stranger on his trail. 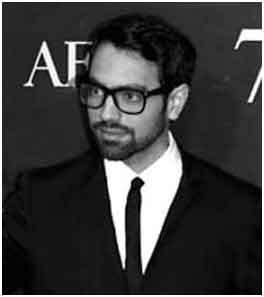 Farbod is an Iranian filmmaker with awards from such festivals as the Hong Kong Asian Film Festival and the Los Angeles Movie Awards. The United Nations, Director’s Guild of America, and the Motion Picture Association of America have screened his films, and Hillary Clinton praised a short film he made about democracy. Farbod has directed commercials for many Ad Agencies and worked with renowned international actors such as Monica Belluci and Dominic Purcell as well as popular singers like Sean Paul, T-Pain, and Snoop Dogg. Many of Farbod’s videos have gone viral and received over 150 million views on YouTube.